This article is about the district of London. For other uses, see East End (disambiguation). The area was notorious for its deep poverty, overcrowding and associated social problems. This led to the East End's history of intense political activism and association with some of the country's most influential social reformers. Another major theme of East End history has been migration, both inward and outward. The area had a strong pull on the rural poor from other parts of England, and attracted waves of migration from further afield, notably Huguenot refugees, who created a new extramural suburb in Spitalfields in the 17th century, Irish weavers, Ashkenazi Jews, and, in the 20th century, Sylheti Bangladeshis. The closure of the last of the East End docks in the Port of London in 1980 created further challenges and led to attempts at regeneration and the formation of the London Docklands Development Corporation. The Canary Wharf development improved infrastructure, and the Olympic Park mean that the East End is undergoing further change, but some parts continue to contain some of the worst poverty in Britain. The East End lies east of the Roman and medieval walls of the City of London, and north of the River Thames. Aldgate Pump, on the edge of the City, is regarded as the symbolic start of the East End. On the river, Tower Bridge is also sometimes described in these terms. Beyond these reference points, the East End has no official or generally accepted boundaries, and views vary as to how much of wider East London lies within it. The narrowest definition restricts the East End to the modern London Borough of Tower Hamlets. A more common preference is to add to Tower Hamlets the former parish and borough of Shoreditch (including Hoxton and Haggerston, now the southern part of the modern London Borough of Hackney, which fall within the E1 and E2 postcode districts). Other commentators prefer a definition still broader, encompassing districts east of the River Lea (i.e. east and north-east of Tower Hamlets), such as West Ham, East Ham, Leyton, Walthamstow and Ilford. The East End began with the medieval growth of London beyond its walls, along the Roman roads leading from Bishopsgate and Aldgate and also alongside the Thames. Growth was much slower in the east, and the modest extensions on this side were separated from the much larger extensions in the west by the marshy open area of Moorfields adjacent to the wall on the north side, which discouraged development in that direction. Building accelerated in the 16th century, and the area that would later become known as the East End began to take shape. In 1720 John Strype gives us our first record of the East End as a distinct entity when he describes London as consisting of four parts: the City of London, Westminster, Southwark, and "That Part beyond the Tower". The relevance of Strype's reference to the Tower was more than geographical. The East End was the urbanised part of an administrative area called the Tower Division, which had owed military service to the Tower of London since time immemorial, having its roots in the Bishop of London's historic Manor of Stepney. Later, as London grew further, the fully urbanised Tower Division became a byword for wider East London, before East London grew further still, east of the River Lea and into Essex. For a very long time the East End was physically separated from London's western growth by the open space known as Moorfields. Shoreditch's boundary with the parish of St Luke's (and its predecessor St Giles-without-Cripplegate) ran through the Moorfields, which became, on urbanisation, the boundary of east and north London. That line, with very slight modifications, also became part of the boundary between the modern London Boroughs of Hackney and Islington. Moorfields remained largely open until 1812, and the longstanding presence of that open space separating the emerging East End from the western urban expansion of London must have helped shape the different economic character of the two parts and perceptions of their distinct identity (see map below). The medieval system of copyhold, which prevailed throughout the East End into the 19th century. Essentially, there was little point in developing land that was held on short leases. The siting of noxious industries, such as tanning and fulling downwind outside the boundaries of the City, and therefore beyond complaints and official controls. The foul-smelling industries partially preferred the East End because the prevailing winds in London traveled from west to east (i.e. it was downwind from the rest of the city), so that most odours from their businesses would not go into the city. The low paid employment in the docks and related industries, made worse by the trade practices of outwork, piecework and casual labour. The concentration of the ruling court and national political centre in Westminster, on the opposite, western side of the City of London. Historically, the East End is arguably conterminous with the Manor of Stepney. This manor was held by the Bishop of London, in compensation for his duties in maintaining and garrisoning the Tower of London. Further ecclesiastic holdings came about from the need to enclose the marshes and create flood defences along the Thames. Edward VI passed the land to the Wentworth family, and thence to their descendants, the Earls of Cleveland. The ecclesiastic system of copyhold, whereby land was leased to tenants for terms as short as seven years, prevailed throughout the manor. This severely limited scope for improvement of the land and new building until the estate was broken up in the 19th century. In medieval times trades were carried out in workshops in and around the owners' premises in the City. By the time of the Great Fire of London in 1666 these were becoming industries, and some were particularly noisome, such as the processing of urine for the tanning industry, or required large amounts of space, such as drying clothes after process and dying in fields known as tentergrounds. Some were dangerous, such as the manufacture of gunpowder or the proving of guns. These activities came to be performed outside the City walls in the near suburbs of the East End. Later, when lead-making and bone-processing for soap and china came to be established, they too located in the East End rather than in the crowded streets of the City. The lands east of the City had always been used as hunting grounds for bishops and royalty, with King John establishing a palace at Bow. The Cistercian Stratford Langthorne Abbey became the court of Henry III in 1267 for the visitation of the Papal legates, and it was here that he made peace with the barons under the terms of the Dictum of Kenilworth. It became the fifth largest Abbey in the country, visited by monarchs and providing a retreat (and a final resting place) for the nobility. The Palace of Placentia at Greenwich, to the south of the river, was built by the Regent to Henry V, Humphrey, Duke of Gloucester and Henry VIII established a hunting lodge at Bromley Hall. These Royal connections continued until after the Interregnum (1649-60) when the Court established itself in the Palace of Whitehall and the offices of politics congregated around them. The East End also lay on the main road to Barking Abbey, important as a religious centre since Norman times and where William the Conqueror had first established his English court. During the Middle Ages, settlements were established predominantly along the lines of the existing roads. The principal villages were Stepney, Whitechapel and Bow. Settlements along the river began at that time to service the needs of shipping on the Thames, but the City of London retained its right to land the goods. The riverside became more active in Tudor times (16th century), as the Royal Navy expanded and international trading developed, and a major fishing port developed downstream at Barking to provide fish for the City. These and other factors meant that industries relating to construction, repair, and victualling of naval and merchant ships flourished in the area. Royalty such as King John had had a hunting lodge at Bromley-by-Bow, and the Bishop of London had a palace at Bethnal Green, but later these estates began to be split up, and estates of fine houses for captains, merchants and owners of manufacturers began to be built. Samuel Pepys moved his family and goods to Bethnal Green during the Great Fire of London, and Captain Cook moved from Shadwell to Stepney Green, where a school and assembly rooms had been established (commemorated by Assembly Passage, and a plaque on the site of Cook's house on the Mile End Road). Mile End Old Town also acquired some fine buildings, and the New Town began to be built. As the area became built up and more crowded, the wealthy sold their plots for subdivision and moved further afield. Into the 18th and 19th centuries, there were still attempts to build fine houses, for example Tredegar Square (1830), and the open fields around Mile End New Town were used for the construction of estates of workers' cottages in 1820. This was designed in 1817 in Birmingham by Anthony Hughes and finally constructed in 1820. Globe Town was established from 1800 to provide for the expanding population of weavers around Bethnal Green, attracted by improving prospects in silk weaving. Bethnal Green's population trebled between 1801 and 1831, with 20,000 looms being operated in people's own homes. By 1824, with restrictions on importation of French silks relaxed, up to half these looms had become idle, and prices were driven down. With many importing warehouses already established in the district, the abundance of cheap labour was turned to boot, furniture and clothing manufacture. Globe Town continued its expansion into the 1860s, long after the silk industry's decline. The East End in 1741–5, as depicted on John Rocque's Exact Survey of the city's of London Westminster ye Borough of Southwark and the Country near ten miles round. London is expanding, but there are still large areas of fields to the east of the City. 1882 Reynolds Map of the East End. Development has now eliminated the open fields shown on the earlier map. 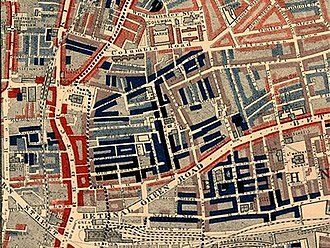 Part of Charles Booth's poverty map showing the Old Nichol slum. Published 1889 in Life and Labour of the People in London. The red areas are "middle class, well-to-do", light blue areas are "poor, 18s to 21s a week for a moderate family", dark blue areas are "very poor, casual, chronic want", and black areas are the "lowest class...occasional labourers, street sellers, loafers, criminals and semi-criminals". Boundary Estate bandstand was built on the rubble from the clearance of the Old Nichol slum. A movement began to clear the slums. Burdett-Coutts built Columbia Market in 1869 and the "Artisans' and Labourers' Dwelling Act" passed in 1876 to provide powers to seize slums from landlords and to provide access to public funds to build new housing. Philanthropic housing associations such as the Peabody Trust were formed to provide homes for the poor and to clear the slums generally. Expansion by the railway companies, such as the London and Blackwall Railway and Great Eastern Railway, caused large areas of slum housing to be demolished. The "Working Classes Dwellings Act" in 1890 placed[on whom?] a new responsibility to house the displaced residents and led to the building of new philanthropic housing such as Blackwall Buildings and Great Eastern Buildings. By 1890 official slum clearance programmes had begun. These included the creation of the world's first council housing, the LCC Boundary Estate, which replaced the neglected and crowded streets of Friars Mount, better known as The Old Nichol Street Rookery. Between 1918 and 1939 the LCC continued replacing East End housing with five- or six-storey flats, despite residents preferring houses with gardens and opposition from shopkeepers who were forced to relocate to new, more expensive premises. The Second World War brought an end to further slum clearance. Industries associated with the sea developed throughout the East End, including rope making and shipbuilding. The former location of roperies can still be identified from their long straight, narrow profile in the modern streets, for instance Ropery Street near Mile End. Shipbuilding was important from the time when Henry VIII caused ships to be built at Rotherhithe as a part of his expansion of the Royal Navy. 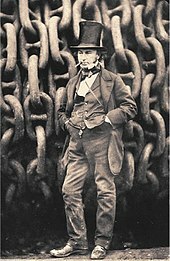 On 31 January 1858, the largest ship of that time, the SS Great Eastern, designed by Isambard Kingdom Brunel, was launched from the yard of Messrs Scott Russell & Co, of Millwall. The 692-foot (211 m) vessel was too long to fit across the river, and so the ship had to be launched sideways. Due to the technical difficulties of the launch, after this, shipbuilding on the Thames went into a long decline. Ships continued to be built at the Thames Ironworks and Shipbuilding Company at Blackwall and Canning Town until the yard closed in 1913, shortly after the launch of the Dreadnought Battleship HMS Thunderer (1911). The West India Docks were established in 1803, providing berths for larger ships and a model for future London dock building. Imported produce from the West Indies was unloaded directly into quayside warehouses. Ships were limited to 6000 tons. The old Brunswick Dock, a shipyard at Blackwall became the basis for the East India Company's East India Docks established there in 1806. The London Docks were built in 1805, and the waste soil and rubble from the construction was carried by barge to west London, to build up the marshy area of Pimlico. These docks imported tobacco, wine, wool and other goods into guarded warehouses within high walls (some of which still remain). They were able to berth over 300 sailing vessels simultaneously, but by 1971 they closed, no longer able to accommodate modern shipping. The most central docks, St Katharine Docks, were built in 1828 to accommodate luxury goods, clearing the slums that lay in the area of the former Hospital of St Katharine. They were not successful commercially, as they were unable to accommodate the largest ships, and in 1864, management of the docks was amalgamated with that of the London Docks. The Millwall Docks were created in 1868, predominantly for the import of grain and timber. These docks housed the first purpose built granary for the Baltic grain market, a local landmark that remained until it was demolished to improve access for the London City Airport. The first railway (the "Commercial Railway") to be built, in 1840, was a passenger service based on cable haulage by stationary steam engines that ran the 3.5 miles (5.6 km) from Minories to Blackwall on a pair of tracks. It required 14 miles (22.5 km) of hemp rope, and "dropped" carriages as it arrived at stations, which were reattached to the cable for the return journey, the train "reassembling" itself at the terminus. The line was converted to standard gauge in 1859, and steam locomotives adopted. The building of London termini at Fenchurch Street (1841), and Bishopsgate (1840) provided access to new suburbs across the River Lea, again resulting in the destruction of housing and increased overcrowding in the slums. After the opening of Liverpool Street station (1874), Bishopsgate railway station became a goods yard, in 1881, to bring imports from Eastern ports. With the introduction of containerisation, the station declined, suffered a fire in 1964 that destroyed the station buildings, and it was finally demolished in 2004 for the extension of the East London Line. In the 19th century, the area north of Bow Road became a major railway centre for the North London Railway, with marshalling yards and a maintenance depot serving both the City and the West India docks. Nearby Bow railway station opened in 1850 and was rebuilt in 1870 in a grand style, featuring a concert hall. The line and yards closed in 1944, after severe bomb damage, and never reopened, as goods became less significant, and cheaper facilities were concentrated in Essex. The River Lea was a smaller boundary than the Thames, but it was a significant one. The building of the Royal Docks consisting of the Royal Victoria Dock (1855), able to berth vessels of up to 8000 tons; Royal Albert Dock (1880), up to 12,000 tons; and King George V Dock (1921), up to 30,000 tons, on the estuary marshes, extended the continuous development of London across the Lea into Essex for the first time. The railways gave access to a passenger terminal at Gallions Reach and new suburbs created in West Ham, which quickly became a major manufacturing town, with 30,000 houses built between 1871 and 1901. Soon afterwards, East Ham was built up to serve the new Gas Light and Coke Company and Bazalgette's grand sewage works at Beckton. From the mid-20th century, the docks declined in use and were finally closed in 1980, leading to the setting up of the London Docklands Development Corporation in 1981. London's main port is now at Tilbury, further down the Thames estuary, outside the boundary of Greater London. The dock had been established in 1886 to bring bulk goods by rail to London, but being nearer the sea and able to accommodate vessels of 50,000 tons, they were more easily converted to the needs of modern container ships in 1968, and so they survived the closure of the inner docks. Various wharves along the river continue to be in use but on a much smaller scale. At the end of the 17th century large numbers of Huguenot weavers arrived in the East End, settling to service an industry that grew up around the new estate at Spitalfields, where master weavers were based. They brought with them a tradition of "reading clubs", where books were read, often in public houses. The authorities were suspicious of immigrants meeting and in some ways they were right to be as these grew into workers' associations and political organisations. Towards the middle of the 18th century the silk industry fell into a decline – partly due to the introduction of printed calico cloth – and riots ensued. These "Spitalfield Riots" of 1769 were actually centred to the east and were put down with considerable force, culminating in two men being hanged in front of the Salmon and Ball public house at Bethnal Green. One was John Doyle (an Irish weaver), the other John Valline (of Huguenot descent). In 1844, an Association for Promoting Cleanliness among the Poor was established, and built a bath-house and laundry in Glasshouse Yard, East Smithfield. This cost a single penny for bathing or washing, and by June 1847 was receiving 4,284 people a year. This led to an Act of Parliament to encourage other municipalities to build their own and the model spread quickly throughout the East End. Timbs noted that "... so strong was the love of cleanliness thus encouraged that women often toiled to wash their own and their children's clothing, who had been compelled to sell their hair to purchase food to satisfy the cravings of hunger". 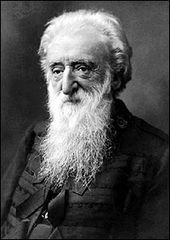 William Booth began his Christian Revival Society in 1865, preaching the gospel in a tent erected in the Friends Burial Ground, Thomas Street, Whitechapel. Others joined his Christian Mission, and on 7 August 1878 the Salvation Army was formed at a meeting held at 272 Whitechapel Road. A statue commemorates both his mission and his work in helping the poor. Dubliner Thomas John Barnardo came to the London Hospital, Whitechapel to train for medical missionary work in China. Soon after his arrival in 1866 a cholera epidemic swept the East End killing 3,000 people. Many families were left destitute, with thousands of children orphaned and forced to beg or find work in the factories. In 1867, Barnardo set up a Ragged School to provide a basic education but was shown the many children sleeping rough. His first home for boys was established at 18 Stepney Causeway in 1870. When a boy died after being turned away (the home was full), the policy was instituted of "No Destitute Child Ever Refused Admission". In 1884, the Settlement movement was founded, with settlements such as Toynbee Hall and Oxford House, to encourage university students to live and work in the slums, experience the conditions and try to alleviate some of the poverty and misery in the East End. Notable residents of Toynbee Hall included R. H. Tawney, Clement Attlee, Guglielmo Marconi, and William Beveridge. The Hall continues to exert considerable influence, with the Workers Educational Association (1903), Citizens Advice Bureau (1949) and Child Poverty Action Group (1965) all being founded or influenced by it. In 1888, the matchgirls of Bryant and May in Bow went on strike for better working conditions. This, combined with the many dock strikes in the same era, made the East End a key element in the foundation of modern socialist and trade union organisations, as well as the Suffragette movement. Towards the end of the 19th century, a new wave of radicalism came to the East End, arriving both with Jewish émigrés fleeing from Eastern European persecution, and Russian and German radicals avoiding arrest. A German émigré anarchist, Rudolf Rocker, began writing in Yiddish for Arbayter Fraynd (Workers' Friend). By 1912, he had organised a mass London garment workers' strike for better conditions and an end to "sweating". Amongst the Russians was fellow anarchist Peter Kropotkin who helped found the Freedom Press in Whitechapel. Afanasy Matushenko, one of the leaders of the Potemkin mutiny, fled the failure of the Russian Revolution of 1905 to seek sanctuary in Stepney Green. Leon Trotsky and Vladimir Lenin attended meetings of the newspaper Iskra in 1903. in Whitechapel; and in 1907 Lenin and Joseph Stalin attended the Fifth Congress of the Russian Social Democratic Labour Party held in a Hoxton church. That congress consolidated the leadership of Lenin's Bolshevik faction and debated strategy for the communist revolution in Russia. Trotsky noted, in his memoires, meeting Maxim Gorky and Rosa Luxemburg at the conference. The poor fellows are miserably clad, scarcely with a boot on their foot, in a most miserable state.... These are men who come to work in our docks who come on without having a bit of food in their stomachs, perhaps since the previous day; they have worked for an hour and have earned 5d. [2p]; their hunger will not allow them to continue: they take the 5d. in order that they may get food, perhaps the first food they have had for twenty-four hours. These conditions earned dockers much public sympathy, and after a bitter struggle, the London Dock Strike of 1889 was settled with victory for the strikers, and established a national movement for the unionisation of casual workers, as opposed to the craft unions that already existed. The philanthropist Angela Burdett-Coutts was active in the East End, alleviating poverty by founding a sewing school for ex-weavers in Spitalfields and building the ornate Columbia Market in Bethnal Green. She helped to inaugurate the London Society for the Prevention of Cruelty to Children, was a keen supporter of the Ragged School Union, and operated housing schemes similar to those of the Model Dwellings Companies such as the East End Dwellings Company and the Four Per Cent Industrial Dwellings Company, where investors received a financial return on their philanthropy. Between the 1890s and 1903, when the work was published, the social campaigner Charles Booth instigated an investigation into the life of London poor (based at Toynbee Hall), much of which was centred on the poverty and conditions in the East End. Further investigations were instigated by the Royal Commission on the Poor Laws and Relief of Distress 1905–09, the Commission found it difficult to agree, beyond that change was necessary and produced separate minority and majority reports. The minority report was the work of Booth with the founders of the London School of Economics Sidney and Beatrice Webb. They advocated focusing on the causes of poverty and the radical notion of poverty being involuntary, rather than the result of innate indolence. At the time their work was rejected but was gradually adopted as policy by successive governments. Sylvia Pankhurst became increasingly disillusioned with the suffragette movement's inability to engage with the needs of working class women, so in 1912 she formed her own breakaway movement, the East London Federation of Suffragettes. She based it at a baker's shop at Bow emblazoned with the slogan, "Votes for Women", in large gold letters. The local Member of Parliament, George Lansbury, resigned his seat in the House of Commons to stand for election on a platform of women's enfranchisement. Pankhurst supported him in this, and Bow Road became the campaign office, culminating in a huge rally in nearby Victoria Park. Lansbury was narrowly defeated in the election, however, and support for the project in the East End was withdrawn. Pankhurst refocused her efforts, and with the outbreak of the First World War, she began a nursery, clinic and cost price canteen for the poor at the bakery. A paper, the Women's Dreadnought, was published to bring her campaign to a wider audience. Pankhurst spent twelve years in Bow fighting for women's rights. During this time, she risked constant arrest and spent many months in Holloway Prison, often on hunger strike. She finally achieved her aim of full adult female suffrage in 1928, and along the way she alleviated some of the poverty and misery, and improved social conditions for all in the East End. The alleviation of widespread unemployment and hunger in Poplar had to be funded from money raised by the borough itself under the Poor Law. The poverty of the borough made this patently unfair and lead to the 1921 conflict between government and the local councillors known as the Poplar Rates Rebellion. Council meetings were for a time held in Brixton prison, and the councillors received wide support. Ultimately, this led to the abolition of the Poor Laws through the Local Government Act 1929. The General Strike had begun as a dispute between miners and their employers outside London in 1925. On 1 May 1926 the Trades Union Congress called out workers all over the country, including the London dockers. The government had had over a year to prepare and deployed troops to break the dockers' picket lines. Armed food convoys, accompanied by armoured cars, drove down the East India Dock Road. By 10 May, a meeting was brokered at Toynbee Hall to end the strike. The TUC were forced into a humiliating climbdown and the general strike ended on 11 May, with the miners holding out until November. Initially, the German commanders were reluctant to bomb London, fearing retaliation against Berlin. On 24 August 1940, a single aircraft, tasked to bomb Tilbury, accidentally bombed Stepney, Bethnal Green and the City. The following night the RAF retaliated by mounting a forty aircraft raid on Berlin, with a second attack three days later. The Luftwaffe changed its strategy from attacking shipping and airfields to attacking cities. The City and West End were designated "Target Area B"; the East End and docks were "Target Area A". The first raid occurred at 4:30 p.m. on 7 September and consisted of 150 Dornier and Heinkel bombers and large numbers of fighters. This was followed by a second wave of 170 bombers. Silvertown and Canning Town bore the brunt of this first attack. Between 7 September 1940 and 10 May 1941, a sustained bombing campaign was mounted. It began with the bombing of London for 57 successive nights, an era known as "the Blitz". East London was targeted because the area was a centre for imports and storage of raw materials for the war effort, and the German military command felt that support for the war could be damaged among the mainly working class inhabitants. On the first night of the Blitz, 430 civilians were killed and 1,600 seriously wounded. The populace responded by evacuating children and the vulnerable to the country and digging in, constructing Anderson shelters in their gardens and Morrison shelters in their houses, or going to communal shelters built in local public spaces. On 10 September 1940, 73 civilians, including women and children preparing for evacuation, were killed when a bomb hit the South Hallsville School. Although the official death toll is 73, many local people believed it must have been higher. Some estimates say 400 or even 600 may have lost their lives during this raid on Canning Town. The effect of the intensive bombing worried the authorities and Mass-Observation was deployed to gauge attitudes and provide policy suggestions, as before the war they had investigated local attitudes to anti-Semitism. The organisation noted that close family and friendship links within the East End were providing the population with a surprising resilience under fire. Propaganda was issued, reinforcing the image of the "brave chirpy Cockney". On the Sunday after the Blitz began, Winston Churchill himself toured the bombed areas of Stepney and Poplar. Anti-aircraft installations were built in public parks, such as Victoria Park and the Mudchute on the Isle of Dogs, and along the line of the Thames, as this was used by the aircraft to guide them to their target. The authorities were initially wary of opening the London Underground for shelter, fearing the effect on morale elsewhere in London and hampering normal operations. On 12 September, having suffered five days of heavy bombing, the people of the East End took the matter into their own hands and invaded tube stations with pillows and blankets. The government relented and opened the partially completed Central line as a shelter. Many deep tube stations remained in use as shelters until the end of the war. Aerial mines were deployed on 19 September 1940. These exploded at roof top height, causing severe damage to buildings over a wider radius than the impact bombs. By now, the Port of London had sustained heavy damage with a third of its warehouses destroyed, and the West India and St Katherine Docks had been badly hit and put out of action. Bizarre events occurred when the River Lea burned with an eerie blue flame, caused by a hit on a gin factory at Three Mills, and the Thames itself burnt fiercely when Tate & Lyle's Silvertown sugar refinery was hit. On 3 March 1943 at 8:27 p.m., the unopened Bethnal Green Underground station was the site of a wartime disaster. Families had crowded into the underground station due to an air-raid siren at 8:17, one of 10 that day. There was a panic at 8:27 coinciding with the sound of an anti-aircraft battery (possibly the recently installed Z battery) being fired at nearby Victoria Park. In the wet, dark conditions, a woman slipped on the entrance stairs and 173 people died in the resulting crush. The truth was suppressed, and a report appeared that there had been a direct hit by a German bomb. The results of the official investigation were not released until 1946. There is now a plaque at the entrance to the tube station, which commemorates the event as the "worst civilian disaster of World War II". The first V-1 flying bomb struck in Grove Road, Mile End, on 13 June 1944, killing six, injuring 30, and making 200 people homeless. The area remained derelict for many years until it was cleared to extend Mile End Park. Before demolition, local artist Rachel Whiteread made a cast of the inside of 193 Grove Road. Despite attracting controversy, the exhibit won her the Turner Prize for 1993. It is estimated that by the end of the war, 80 tons of bombs had fallen on the Metropolitan Borough of Bethnal Green alone, affecting 21,700 houses, destroying 2,233 and making a further 893 uninhabitable. In Bethnal Green, 555 people were killed, and 400 were seriously injured. For the whole of Tower Hamlets, a total of 2,221 civilians were killed, and 7,472 were injured, with 46,482 houses destroyed and 47,574 damaged. 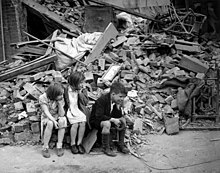 So badly battered was the East End that when Buckingham Palace was hit during the height of the bombing, Queen Elizabeth observed that "It makes me feel I can look the East End in the face." By the end of the war, the East End was a scene of devastation, with large areas derelict and depopulated. War production was changed quickly to making prefabricated houses, and many were installed in the bombed areas and remained common into the 1970s. Today, 1950s and 1960s architecture dominates the housing estates of the area such as the Lansbury Estate in Poplar, much of which was built as a show-piece of the 1951 Festival of Britain. Society at large viewed the East End with a mixture of suspicion and fascination, with the use of the term East End in a pejorative sense beginning in the late 19th century, as the expansion of London's population led to extreme overcrowding throughout the area and a concentration of poor people and immigrants. The problems were exacerbated with the construction of St Katharine Docks (1827) and the central London railway termini (1840–1875) that caused the clearance of former slums and rookeries, with many of the displaced people moving into the East End. Over the course of a century, the East End became synonymous with poverty, overcrowding, disease and criminality. [The] invention about 1880 of the term "East End" was rapidly taken up by the new halfpenny press, and in the pulpit and the music hall ... A shabby man from Paddington, St Marylebone or Battersea might pass muster as one of the respectable poor. But the same man coming from Bethnal Green, Shadwell or Wapping was an "East Ender", the box of Keating's bug powder must be reached for, and the spoons locked up. In the long run this cruel stigma came to do good. It was a final incentive to the poorest to get out of the "East End" at all costs, and it became a concentrated reminder to the public conscience that nothing to be found in the "East End" should be tolerated in a Christian country. This idea of the East End as lying beyond the pale of respectability was also emphasised by Jack London when he visited London in 1902, and found that his Hackney carriage driver claimed not to know it. London observed: "Thomas Cook and Son, path-finders and trail-clearers, living sign-posts to all the World.... knew not the way to the East End". Internally the area generally took pride in a "Cockney identity", although this term has both a geographic and a linguistic connotation and, as so often with London, is hard to pin down (see also East End of London in popular culture). A traditional definition is that to be a Cockney, one had to be born within the sound of Bow Bells, situated in Cheapside. In general, the sound pattern would cover most of the City, and parts of the near East End such as Aldgate and Whitechapel, but it is unlikely that the bells would have been heard in the docklands. In practice, with Royal London the only maternity hospital nearby, few would today be born within earshot. In practice people from all over the East End, inner East London and occasionally beyond identify as Cockneys. The linguistic use of Cockney is more identifiable, with lexical borrowings from Yiddish, Romani, and costermonger slang, and a distinctive accent that features T-glottalization, a loss of dental fricatives and diphthong alterations, amongst others. The accent is said to be a remnant of early English London speech, modified by the many immigrants to the area. The Cockney accent has suffered a long decline, beginning with the introduction in the 20th century of received pronunciation, the more recent adoption of Estuary English, which itself contains many features of Cockney English, and finally with mass immigration that has made native English speakers a minority in the area. Cockney English is spoken widely in the East End, wider East London and more widely in traditionally working-class areas across London. There is a Cockney derivative called Estuary English, heavily influenced by Cockney and named after the Thames Estuary area where the movement of East Londoners to south Essex and to a lesser extent parts on north Kent led it to be widely spoken. Estuary English can also be heard in various other places around the Home Counties. Within London Cockney speech is, to a significant degree, being replaced by Multicultural London English, a form of speech with a significant Cockney influence. Throughout history the area has absorbed waves of immigrants, who have added new dimensions to its culture and history, most notably the French Protestant Huguenots in the 17th century, the Irish in the 18th century, Ashkenazi Jews fleeing pogroms in Eastern Europe towards the end of the 19th century, and the Sylheti Bangladeshis community in the 1960s. Immigrant communities first developed in the riverside settlements. From the Tudor era until the 20th century, ships' crews were employed on a casual basis. New and replacement crew would be found wherever they were available, local sailors being particularly prized for their knowledge of currents and hazards in foreign ports. Crews were paid at the end of their voyages. Inevitably, permanent communities became established, including colonies of Lascars and Africans from the Guinea Coast. Large Chinatowns at both Shadwell and Limehouse developed, associated with the crews of merchantmen in the opium and tea trades. It was only after the devastation of the Second World War that this predominantly Han Chinese community relocated to Soho. In 1786, the Committee for the Relief of the Black Poor was formed by citizens concerned at the size of London's indigent Black population, many of whom had been expelled from North America as Black Loyalists — former slaves who had fought on the side of the British in the American Revolutionary War. Others were discharged sailors and some a legacy of British involvement in the slave trade. The committee distributed food, clothing, and medical aid and found work for men, from various locations including the White Raven tavern in Mile End. They also helped the men to go abroad, some to Canada. In October 1786, the Committee funded an ill-fated expedition of 280 black men, 40 black women and 70 white women (mainly wives and girlfriends) to settle in Sierra Leone. From the late 19th century, a large African mariner community was established in Canning Town as a result of new shipping links to the Caribbean and West Africa. Immigrants have not always been readily accepted. In 1517 the Evil May Day riots, in which foreign-owned property was attacked, resulted in the deaths of 135 Flemings in Stepney. The Gordon Riots of 1780 began with burnings of the houses of Catholics and their chapels in Poplar and Spitalfields. In the 1870s and 1880s, so many Jewish émigrés were arriving that over 150 synagogues were built. Today four active synagogues remain in Tower Hamlets: the Congregation of Jacob Synagogue (1903 – Kehillas Ya'akov), the East London Central Synagogue (1922), the Fieldgate Street Great Synagogue (1899) and Sandys Row Synagogue (1766). Jewish immigration to the East End peaked in the 1890s, leading to anti-foreigner agitation by the British Brothers League, formed in 1902 by Captain William Stanley Shaw and the Conservative MP for Stepney, Major Evans-Gordon, who had overturned a Liberal majority in the 1900 General Election on a platform of limiting immigration. In Parliament in 1902, Evans-Gordon claimed that "not a day passes but English families are ruthlessly turned out to make room for foreign invaders. The rates are burdened with the education of thousands of foreign children." Jewish immigration slowed only with the passing of the Aliens Act 1905, which gave the Home Secretary powers to regulate and control immigration. At the beginning of the 20th century, London was the capital of the extensive British Empire, which contained tens of millions of Muslims, but London had no mosque for Muslim residents or visitors. On 9 November 1910, at a meeting of Muslims and non-Muslims at the Ritz Hotel, the London Mosque Fund was established with the aims of organising weekly Friday prayers and providing a permanent place of worship for Muslims in London. From 1910 to 1940 various rooms had been hired for Jumu'ah prayers on Fridays. Finally, in 1940, three houses were purchased at 446–448 Commercial Road in the East End of London as a permanent place of prayer. On 2 August 1941 the combined houses were inaugurated as the East London Mosque and Islamic Culture Centre at a ceremony attended by the Egyptian Ambassador, Colonel Sir Gordon Neal (representing the Secretary of State for India). The first prayer was led by the Ambassador for Saudi Arabia, Shaikh Hafiz Wahba. From the late 1950s the local Muslim population began to increase due to further immigration from the Indian subcontinent, particularly from Sylhet in East Pakistan, which became Bangladesh in 1971. The migrants settled in areas already established by the Sylheti expatriate community, working in the local docks and Jewish tailoring shops set up in the days of British India. [page needed] During the 1970s, this immigration increased significantly. In 1975 the local authority bought the properties in Commercial Road under a compulsory purchase order, in return providing a site with temporary buildings on Whitechapel Road. The local community set about raising funds to erect a purpose-built mosque on the site. King Fahd of Saudi Arabia donated £1.1 million of the £2 million fund, and the governments of Kuwait and Britain also donated to the fund. Seven years later, the building of the new mosque commenced, with foundations laid in 1982 and construction completed in 1985. It was one of the first mosques in the European Union to broadcast the adhan from the minaret using loudspeakers. Currently, the mosque has a capacity of 7,000, with prayer areas for men and women and classroom space for supplementary education. By the 1990s the capacity was already insufficient for the growing congregation and the range of projects based there. Community tensions were again raised by an antisemitic Fascist march that took place in 1936 and was blocked by residents and activists at the Battle of Cable Street. From the mid-1970s anti-Asian violence occurred, culminating in the murder on 4 May 1978 of 25-year-old clothing worker Altab Ali by three white teenagers in a racially motivated attack. Bangladeshi groups mobilised for self-defence, 7,000 people marched to Hyde Park in protest, and the community became more politically involved. The former churchyard of St Mary's Whitechapel, near where the attack took place, was renamed "Altab Ali Park" in 1998 in commemoration of his death. Racial tension has continued with occasional outbreaks of violence, and in 1993 the British National Party won a council seat (since lost). A 1999 bombing in Brick Lane was part of a series that targeted ethnic minorities, gays and "multiculturalists". As London extended east, East Enders often moved to opportunities in the new suburbs. The late 19th century saw a major movement of people to West Ham and East Ham to service the new docks and industries established there. There was significant work to alleviate overcrowded housing from the start of the 20th century under the London County Council. Between the wars, people moved to new estates built for this purpose, in particular at Becontree and Harold Hill, or out of London entirely. The Second World War devastated much of the East End, with its docks, railways and industry forming a continual target for bombing, especially during the Blitz, leading to dispersal of the population to new suburbs and new housing being built in the 1950s. Many East Enders went further than the eastern suburbs, leaving London altogether, notably to the Essex new towns of Basildon and Harlow and a number of expanded towns in south Essex and elsewhere. The resulting depopulation accelerated after the Second World War and has only recently begun to reverse. By comparison, in 1801 the population of England and Wales was 9 million; by 1851 it had more than doubled to 18 million, and by the end of the century had reached 40 million. Today, Bangladeshis form the largest minority population in Tower Hamlets, constituting 33.5% of the borough's population at the 2001 census; the Bangladeshi community there is the largest such community in Britain. The 2006 estimates show a decline in this group to 29.8% of the population, reflecting a movement to better economic circumstances and the larger houses available in the eastern suburbs. In this, the latest group of migrants are following a pattern established for over three centuries. The high levels of poverty in the East End have, throughout history, corresponded with a high incidence of crime. From earliest times, crime depended, as did labour, on the importing of goods to London, and their interception in transit. Theft occurred in the river, on the quayside and in transit to the City warehouses. This was why, in the 17th century, the East India Company built high-walled docks at Blackwall and had them guarded to minimise the vulnerability of their cargoes. Armed convoys would then take the goods to the company's secure compound in the City. The practice led to the creation of ever-larger docks throughout the area, and large roads to drive through the crowded 19th century slums to carry goods from the docks. No police force operated in London before the 1750s. Crime and disorder were dealt with by a system of magistrates and volunteer parish constables, with strictly limited jurisdiction. Salaried constables were introduced by 1792, although they were few in number and their power and jurisdiction continued to derive from local magistrates, who in extremis could be backed by militias. 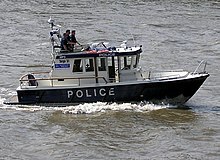 In 1798, England's first Marine Police Force was formed by magistrate Patrick Colquhoun and a Master Mariner, John Harriott, to tackle theft and looting from ships anchored in the Pool of London and the lower reaches of the river. Its base was (and remains) in Wapping High Street. It is now known as the Marine Support Unit. In 1829, the Metropolitan Police Force was formed, with a remit to patrol within 7 miles (11 km) of Charing Cross, with a force of 1,000 men in 17 divisions, including 'H' division, based in Stepney. Each division was controlled by a superintendent, under whom were four inspectors and sixteen sergeants. The regulations demanded that recruits should be under thirty-five years of age, well built, at least 5-foot-7-inch (1.70 m) in height, literate and of good character. Unlike the former constables, the police were recruited widely and financed by a levy on ratepayers; so they were initially disliked. The force took until the mid-19th century to be established in the East End. Unusually, Joseph Sadler Thomas, a Metropolitan Police superintendent of "F" (Covent Garden) Division, appears to have mounted the first local investigation (in Bethnal Green), in November 1830 of the London Burkers. A specific Dockyard division of the Metropolitan force was formed to assume responsibility for shore patrols within the docks in 1841, a detective department was formed in 1842, and in 1865, "J" division was established in Bethnal Green. 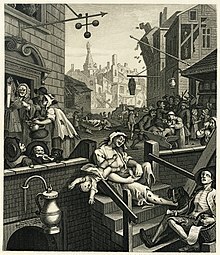 William Hogarth's depiction of London vice, Gin Lane (1751). One of the East End industries that serviced ships moored off the Pool of London was prostitution, and in the 17th century, this was centred on the Ratcliffe Highway, a long street lying on the high ground above the riverside settlements. In 1600, it was described by the antiquarian John Stow as "a continual street, or filthy straight passage, with alleys of small tenements or cottages builded, inhabited by sailors and victuallers". Crews were paid off at the end of a long voyage, and would spend their earnings on drink in the local taverns. One madame described as "the great bawd of the seamen" by Samuel Pepys was Damaris Page. Born in Stepney in approximately 1610, she had moved from prostitution to running brothels, including one on the Highway that catered for ordinary seaman and a further establishment nearby that catered for the more expensive tastes amongst the officers and gentry. She died wealthy, in 1669, in a house on the Highway, despite charges being brought against her and time spent in Newgate Prison. By the 19th century, an attitude of toleration had changed, and the social reformer William Acton described the riverside prostitutes as a "horde of human tigresses who swarm the pestilent dens by the riverside at Ratcliffe and Shadwell". The Society for the Suppression of Vice estimated that between the Houndsditch, Whitechapel and Ratcliffe areas there were 1803 prostitutes; and between Mile End, Shadwell and Blackwall 963 women in the trade. They were often victims of circumstance, there being no welfare state and a high mortality rate amongst the inhabitants that left wives and daughters destitute, with no other means of income. At the same time, religious reformers began to introduce "seamens' missions" throughout the dock areas that sought both to provide for seafarers' physical needs and to keep them away from the temptations of drink and women. Eventually, the passage of the Contagious Diseases Prevention Act in 1864 allowed policemen to arrest prostitutes and detain them in hospital. The act was repealed in 1886, after agitation by early feminists, such as Josephine Butler and Elizabeth Wolstenholme, led to the formation of the Ladies National Association for the Repeal of the Contagious Diseases Acts. Notable crimes in the area include the Ratcliff Highway murders (1813); the killings committed by the London Burkers (apparently inspired by Burke and Hare) in Bethnal Green (1831); the notorious serial killings of prostitutes by Jack the Ripper (1888); and the Siege of Sidney Street (1911) (in which anarchists, inspired by the legendary Peter the Painter, took on Home Secretary Winston Churchill, and the army). In the 1960s the East End was the area most associated with gangster activity, most notably that of the Kray twins. The 1996 Docklands bombing caused significant damage around South Quay Station, to the south of the main Canary Wharf development. Two people were killed and thirty-nine injured in one of Mainland Britain's biggest bomb attacks by the Provisional Irish Republican Army. 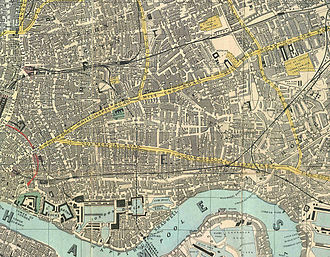 This led to the introduction of police checkpoints controlling access to the Isle of Dogs, reminiscent of the City's "ring of steel'"
Many disasters have befallen the residents of the East End, both in war and in peace. In particular, as a maritime port, plague and pestilence have disproportionately fallen on the residents of the East End. The area most afflicted by the Great Plague (1665) was Spitalfields, and cholera epidemics broke out in Limehouse in 1832 and struck again in 1848 and 1854. Typhus and tuberculosis were also common in the crowded 19th century tenements. The Princess Alice was a passenger steamer crowded with day trippers returning from Gravesend to Woolwich and London Bridge. On the evening of 3 September 1878, she collided with the steam collier Bywell Castle (named for Bywell Castle) and sank into the Thames in under four minutes. Of the approximately 700 passengers, over 600 were lost. During the First World War, the morning of 13 June 1917 was the first ever daylight air-raid over the East End which in total killed 104 people. Sixteen of the dead were 5 and 6 year olds who were sitting in their class room at Upper North Street School, Poplar when the bomb hit. The memorial which still stands today in Poplar Recreation Ground was built by A.R. Adams, a local funeral director at the time. Also, on 19 January 1917, 73 people died, including 14 workers, and more than 400 were injured, in a TNT explosion in the Brunner-Mond munitions factory in Silvertown. Much of the area was flattened, and the shock wave was felt throughout the city and much of Essex. This was the largest explosion in London history, and was heard in Southampton and Norwich. Andreas Angel, chief chemist at the plant, was posthumously awarded the Edward Medal for trying to extinguish the fire that caused the blast. The same year, on 13 June, a bomb from a German Gotha bomber killed 18 children in their primary school in Upper North Street, Poplar. This event is commemorated by the local war memorial erected in Poplar Recreation Ground, but during the war a total of 120 children and 104 adults were killed in the East End by aerial bombing, with many more injured. Another tragedy occurred on the morning of 16 May 1968 when Ronan Point, a 23-storey tower block in Newham, suffered a structural collapse due to a natural gas explosion. Four people were killed in the disaster and seventeen were injured, as an entire corner of the building slid away. The collapse caused major changes in UK building regulations and led to the decline of further building of high rise council flats that had characterised 1960s public architecture. Inn-yard theatres were first established in the Tudor period, with the Boar's Head Inn (1557) in Whitechapel, the George in Stepney and a purpose built, but short lived, John Brayne's Red Lion Theatre (1567), nearby. The first permanent theatres with resident companies were constructed in Shoreditch, with James Burbage's The Theatre (1576) and Henry Lanman's Curtain Theatre (1577) standing close together. On the night of 28 December 1598 Burbage's sons dismantled The Theatre, and moved it piece by piece across the Thames to construct the Globe Theatre. The Goodman's Fields Theatre was established in 1727, and it was here that David Garrick made his successful début as Richard III, in 1741. In the 19th century the theatres of the East End rivalled in their grandiosity and seating capacity those of the West End. The first of this era was the ill-fated Brunswick Theatre (1828), which collapsed three days after opening, killing 15 people. This was followed by the opening of the Pavilion Theatre, Whitechapel (1828), the Garrick (1831) in Leman Street, the Effingham (1834) in Whitechapel, the Standard (1835) in Shoreditch, the City of London (1837) in Norton Folgate, then the Grecian and the Britannia Theatre in Hoxton (1840). Though very popular for a time, from the 1860s onwards these theatres, one by one, began to close, the buildings were demolished and their very memory began to fade. There were also many Yiddish theatres, particularly around Whitechapel. These developed into professional companies, after the arrival of Jacob Adler in 1884 and the formation of his Russian Jewish Operatic Company that first performed in Beaumont Hall, Stepney, and then found homes both in the Prescott Street Club, Stepney, and in Princelet Street in Spitalfields. The Pavilion became an exclusively Yiddish theatre in 1906, finally closing in 1936 and being demolished in 1960. Other important Jewish theatres were Feinmans, The Jewish National Theatre and the Grand Palais. Performances were in Yiddish, and predominantly melodrama. These declined, as audience and actors left for New York and the more prosperous parts of London. The once popular music halls of the East End have mostly met the same fate as the theatres. Prominent examples included the London Music Hall (1856–1935), 95-99 Shoreditch High Street, and the Royal Cambridge Music Hall (1864–1936), 136 Commercial Street. An example of a "giant pub hall", Wilton's Music Hall (1858), remains in Grace's Alley, off Cable Street and the early "saloon style" Hoxton Hall (1863) survives in Hoxton Street, Hoxton. Many popular music hall stars came from the East End, including Marie Lloyd. The music hall tradition of live entertainment lingers on in East End public houses, with music and singing. This is complemented by less respectable amusements such as striptease, which, since the 1950s has become a fixture of certain East End pubs, particularly in the area of Shoreditch, despite being a target of local authority restraints. Novelist and social commentator Walter Besant proposed a "Palace of Delight" with concert halls, reading rooms, picture galleries, an art school and various classes, social rooms and frequent fêtes and dances. This coincided with a project by the philanthropist businessman, Edmund Hay Currie to use the money from the winding up of the Beaumont Trust, together with subscriptions to build a "People's Palace" in the East End. Five acres of land were secured on the Mile End Road, and the Queen's Hall was opened by Queen Victoria on 14 May 1887. The complex was completed with a library, swimming pool, gymnasium and winter garden, by 1892, providing an eclectic mix of populist entertainment and education. A peak of 8000 tickets were sold for classes in 1892, and by 1900, a Bachelor of Science degree awarded by the University of London was introduced. In 1931, the building was destroyed by fire, but the Draper's Company, major donors to the original scheme, invested more to rebuild the technical college and create Queen Mary's College in December 1934. A new 'People's Palace' was constructed, in 1937, by the Metropolitan Borough of Stepney, in St Helen's Terrace. This finally closed in 1954. Professional theatre returned briefly to the East End in 1972, with the formation of the Half Moon Theatre in a rented former synagogue in Aldgate. In 1979, they moved to a former Methodist chapel, near Stepney Green and built a new theatre on the site, opening in May 1985, with a production of Sweeney Todd. The theatre enjoyed success, with premières by Dario Fo, Edward Bond and Steven Berkoff, but by the mid-1980s, the theatre suffered a financial crisis and closed. After years of disuse, it has been converted to a public house. The theatre spawned two further arts projects: the Half Moon Photography Workshop, exhibiting in the theatre and locally, and from 1976 publishing Camerwork, and the Half Moon Young People's Theatre, which remains active in Tower Hamlets. The football team followed by many East End people is West Ham United, founded in 1895 as Thames Ironworks. The 'other' East London clubs are Leyton Orient, and to a lesser extent Dagenham and Redbridge, but rather than rivalry, there is some overlap of support. Millwall F.C. originally played in the area of that name on the Isle of Dogs, but moved south of the Thames in 1910. Historically, the East End has suffered from under-investment in both housing stock and infrastructure. From the 1950s, the East End represented the structural and social changes affecting the UK economy in a microcosm. The area had one of the highest concentrations of council housing, the legacy both of slum clearance and wartime destruction. The progressive closure of docks, cutbacks in railways and the closure and relocation of industry contributed to a long-term decline, removing many of the traditional sources of low- and semi-skilled jobs. But beginning with the LDDC in the 1980s, there have been a number of urban renewal projects, most notably Canary Wharf, a huge commercial and housing development on the Isle of Dogs. Many of the 1960s tower blocks have been demolished or renovated, replaced by low-rise housing, often in private ownership, or owned by housing associations. The area around Old Spitalfields Market and Brick Lane, called "London's curry capital", has been extensively regenerated and, amongst other things, dubbed Bangla Town. The contribution of Bangladeshi people to British life was recognised in 1998, when Pola Uddin, Baroness Uddin of Bethnal Green became the first Bangladeshi-born Briton to enter the House of Lords and the first Muslim peer to swear her oath of allegiance in the name of her own faith. Her glory was short-lived as she was investigated and suspended from the House of Lords for an expenses scandal, in which she was found guilty of offences. The area is also home to a number of commercial and public art galleries, including the newly expanded Whitechapel Gallery. The artists Gilbert and George have long made their home and workshop in Spitalfields, and the neighbourhood around Hoxton Square has become a centre for modern British art, including the White Cube gallery, with many artists from the Young British Artists movement living and working in the area. This has made the area around Hoxton and Shoreditch fashionable, with many former residents now driven out by higher property prices, and a busy nightlife has developed, with over 80 licensed premises around Shoreditch. By the mid-1980s, both the District line (extended to the East End in 1884 and 1902) and Central line (1946) were running beyond their capacity, and the Docklands Light Railway (1987) and Jubilee line (1999) were constructed to improve rail communications through the riverside district. There was a long-standing plan to provide London with an inner motorway box, the East Cross Route. Apart from a short section, this was never built, but road communications were improved by the completion of the Limehouse Link tunnel under Limehouse Basin in 1993 and the extension of the A12 connecting to the Blackwall Tunnel with an upgraded carriageway in the 1990s. The extension of the East London line to the north, on the border between Islington and Hackney, provided further travel links in 2010. From 2017, Crossrail line 1 is expected to create a fast railway service across London, from east to west, with a major interchange at Whitechapel. New river crossings are planned at Beckton, (the Thames Gateway Bridge) and the proposed Silvertown Link road tunnel, to supplement the existing Blackwall Tunnel. The 2012 Summer Olympics and Paralympics were held in an Olympic Park created on former industrial land around the River Lea. It is intended that this should leave a legacy of new sports facilities, housing, and industrial and technical infrastructure that will further help regenerate the area. This is linked to a new Stratford International station in the Newham, and the future Stratford City development. Also in Newham is London City Airport, built in 1986 in the former King George V Dock, a small airport serving short-haul domestic and European destinations. In the same area, the University of East London has developed a new campus, which provided the United States Olympic Team its training base during the London 2012 Olympic and Paralympic Games. The Queen Mary campus has expanded into new accommodation both adjacent to its existing site at Mile End, and with specialist medical campuses at the Royal London Hospital, Whitechapel and at Charterhouse Square in the City. Whitechapel is the base for the London Air Ambulance, and the hospital's clinical facilities are undergoing a £1 billion refurbishment and expansion. Still, much of the area remains among the poorest in Britain. This is in spite of rising property prices and the extensive building of luxury apartments centred largely around the former dock areas and alongside the Thames. With rising costs elsewhere in the capital and the availability of brownfield land, the East End has become a desirable place for business. 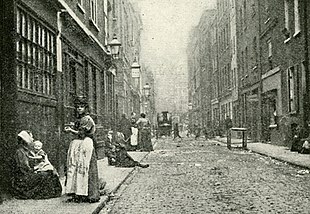 The East End has been the subject of parliamentary commissions and other examinations of social conditions since the 19th century, as seen in Henry Mayhew's London Labour and the London Poor (1851) and Charles Booth's Life and Labour of the People in London (third, expanded edition 1902-3, in 17 volumes). Arthur Morrison's novel A Child of the Jago (1896) is set in Bethnal Green, and recounts the story of a boy growing up in a slum surrounding Arnold Circus. Narrative accounts of experiences amongst the East End poor were also written by Jack London in The People of the Abyss (1903), by George Orwell in parts of his novel Down and Out in Paris and London, recounting his own experiences in the 1930s, as well as the Jewish writer Emanuel Litvinoff in his autobiographical novel Journey Through a Small Planet set in the 1930s. A further detailed study of Bethnal Green was carried out in the 1950s by sociologists Michael Young and Peter Willmott, in Family and Kinship in East London. Themes from these social investigations have been drawn out in fiction. Crime, poverty, vice, sexual transgression, drugs, class-conflict and multi-cultural encounters and fantasies involving Jewish, Chinese and Indian immigrants are major themes. Though the area has been productive of local writing talent, from the time of Oscar Wilde's The Picture of Dorian Gray (1891) the idea of 'slumming it' in the 'forbidden' East End has held a fascination for a coterie of the literati. The image of the East Ender changed dramatically between the 19th century and the 20th. From the 1870s they were characterised in culture as often shiftless, untrustworthy and responsible for their own poverty. However, many East Enders worked in lowly but respectable occupations such as carters, porters and costermongers. This latter group particularly became the subject of music hall songs at the turn of the 20th century, with performers such as Marie Lloyd, Gus Elen and Albert Chevalier establishing the image of the humorous East End Cockney and highlighting the conditions of ordinary workers. This image, buoyed by close family and social links and the community's fortitude in the war, came to be represented in literature and film. However, with the rise of the Kray twins in the 1960s the dark side of East End character returned with a new emphasis on criminality and gangsterism. The success of Jennifer Worth's memoir Call the Midwife (2002, reissued 2007), which became a major best-seller and was adapted by the BBC into their most popular new programme since the current ratings system began, has led to a high level of interest in true-life stories from the East End. Melanie McGrath's Silvertown (2003), about her grandmother's life in the East End, was also a best-seller, as was the follow-up Hopping, about the annual East Enders' 'holiday' hop-picking in Kent. A raft of similar books was published in the 2000s, among them Gilda O'Neill's best-selling Our Street (2004), Piers Dudgeon's Our East End (2009), Jackie Hyam's Bombsites and Lollipops (2011) and Grace Foakes' Four Meals for Fourpence (reprinted 2011). In 2012, HarperCollins published The Sugar Girls, a book which tells the true stories of women working at Tate & Lyle's factories in Silvertown since 1944. The authors commented that many of the East Enders they interviewed were unhappy with the way their neighbourhoods had previously been portrayed in books and on screen – as squalid and criminal, in the Dickensian vein, and as a result they were keen to emphasise the positive aspects of East End life and community. 2012 also saw the publication of Spitalfields Life, a book adapted from the very successful blog of the same name, in which 'the gentle author' (who is anonymous) writes about, and celebrates, the lives of the men and women who live and work in the East End community of Spitalfields. ^ The New Oxford Dictionary of English (1998) ISBN 0-19-861263-X – p.582 "East End the part of London east of the City as far as the River Lea, including the Docklands". ^ Tames, Richard (2004). East End Past. London: Historical Publications. ISBN 9780948667947. , treats the area as coextensive with Tower Hamlets, while acknowledging that this excludes parts of the London Borough of Hackney, such as Shoreditch and Hoxton, which many would regard as belonging to the East End. ^ Fishman 1988, p. xi, identifies his area of study as Tower Hamlets. ^ a b Newland, Paul (2008). The Cultural Construction of London's East End. Amsterdam: Rodopi. ISBN 9789042024540. ^ a b c d e f g h i j k Palmer, Alan (1989). The East End. London: John Murray. ISBN 0-7195-5666-X. ^ Houses of Cistercian monks: Abbey of Stratford Langthorne, A History of the County of Essex: Volume 2 (1907), pp. 129-133 accessed: 30 April 2008. ^ "Bethnal Green: Building and Social Conditions from 1837 to 1875", A History of the County of Middlesex: Volume 11: Stepney, Bethnal Green (1998), pp. 120-26 accessed: 14 November 2006. ^ Toynbee Hall, named for Arnold Toynbee was founded in 1884 in Commercial Street as a centre for social reform by Samuel and Henrietta Barnett with support from Balliol and Wadham College, Oxford; its work continues today. ^ a b Fishman 1988. ^ John Burns is commemorated in the name given to a current Woolwich Ferry. ^ Sheridan, Yoel (2001). From Here to Obscurity. London: Tenterbooks. ISBN 0-9540811-0-2. ^ An earlier planned evacuation had been met with intense distrust in the East End, families preferring to remain united and in their own homes (see Palmer, 1989). ^ Andrew Swinney (17 February 2003). "HISTORY TOUR – Disaster! 2". Webapps.newham.gov.uk. Archived from the original on 2 September 2011. Retrieved 23 July 2011. ^ "Biography of Queen Elizabeth, the Queen Mother". BritainExpress. Retrieved 13 February 2007. ^ Jennifer Wilding. "The Will to Fight". On War. Archived from the original on 23 October 2006. Retrieved 13 February 2007. ^ Pre-fabricated housing was constructed under the auspices of the Burt Committee and the Housing (Temporary Accommodation) Act 1944. ^ The Nineteenth Century XXIV (1888), p. 292; quoted in Fishman 1988, p. 1. ^ Jack London, The People of the Abyss (1903). ^ Eade, John (1996). "Nationalism, Community, and the Islamization of Space in London". In Metcalf, Barbara Daly (ed.). Making Muslim Space in North America and Europe. Berkeley: University of California Press. pp. 223–224. ISBN 978-0520204041. Retrieved 19 April 2015. As one of the few mosques in Britain permitted to broadcast calls to prayer (azan), the mosque soon found itself at the center of a public debate about “noise pollution” when local non-Muslim residents began to protest. ^ Further relief was distributed at the Yorkshire Stingo, on the south side of Marylebone Road, with other centres of black poor being the rookery of Seven Dials and Marylebone. ^ Humayun Ansari, ed. (30 June 2011). The Making of the East London Mosque, 1910-1951: Minutes of the London Mosque Fund and East London Mosque Trust Ltd (Camden Fifth Series). Cambridge University Press. ASIN 1107014921. ^ History. East London Mosque. Retrieved on 12 September 2007. ^ Anne J. Kershen (2005). Strangers, Aliens and Asians: Huguenots, Jews and Bangladeshis in Spitalfields 1660–2000. Routledge. ISBN 978-0-7146-5525-3. ^ Metcalf, Barbara (1996). Making Muslim Space in North America and Europe. University of California Press. p. 219. ISBN 978-0520204041. ^ Kibria, Nazli (1996). Muslims in Motion: Islam and National Identity in the Bangladeshi Diaspora. Rutgers University Press. p. 103. ISBN 978-0813550558. ^ 2001 Census (29 April 2001). "Census 2001 Profiles — Tower Hamlets". National Statistics Online. Retrieved 26 March 2009. ^ Bangladeshi population estimates Archived 13 June 2011 at the Wayback Machine – Tower Hamlets Neighbourhood Statistics (Office for National Statistics). (13 July 2006). Retrieved 27 March 2009. ^ The Silvertown Explosion: London 1917 Graham Hill and Howard Bloch (Stroud: Tempus Publishing 2003). ISBN 0-7524-3053-X. ^ The Poplar War Memorial is an exclusively civilian memorial, reflecting the pacifism of the Mayor Will Crooks and local MP George Lansbury. ^ Housing associations, also known as registered social landlords, active in the East End, include: BGVPHA (Bethnal Green and Victoria Park Housing Association), Tower Hamlets Community Housing, Poplar HARCA and EastendHomes. ^ "Brick Lane Named 'Curry Capital 2012′". Londonist. 31 March 2011. Retrieved 23 July 2011. ^ Webster, Ben (21 April 2006). "Ghost train station that cost £210 m". The Times. London. Retrieved 24 July 2007. ^ "University of East London Olympic Partnerships". Archived from the original on 23 September 2010. ^ Glinert, Ed (6 August 2015). East End Chronicles. Penguin Books Limited. ISBN 9780141982366. ^ "Call the Midwife series ends on ratings high". BBC News. 20 February 2012. Retrieved 9 March 2012. ^ "Hopping by Melanie McGrath". HarperCollins. 16 January 2009. Retrieved 9 March 2012. ^ "East End chronicler Gilda O'Neill dies". The Guardian. 29 September 2010. Retrieved 9 March 2012. ^ "Oral History & Creative Non-Fiction: Telling the Lives of the Sugar Girls". History Workshop Online. 11 March 2012. Retrieved 11 March 2012. ^ "Call The Midwife". The Sugar Girls blog. 19 February 2012. Retrieved 9 March 2012. ^ "Book Review: Spitalfields Life By The Gentle Author". Londonist. 28 February 2012. Retrieved 9 March 2012. Gerzina, Gretchen (1995). Black London: life before emancipation. New Brunswick, New Jersey: Rutgers UP. ISBN 0-8135-2259-5. Marriott, John (2012). Beyond the Tower: A History of East London. Padstow, Cornwall: Yale University Press. ISBN 0300187750. Wikivoyage has a travel guide for London/East End. Wikimedia Commons has media related to East End of London. The Isle of Dogs is a district in East London and is in the London Borough of Tower Hamlets, and is a part of the East End. It is referred to as the Island, It is bounded on three sides by one of the largest meanders in the River Thames. The northern boundary has never been clearly or consistently defined but many accept it to be the (former) line of the West India South Dock. The name Isle of Dogs had no official status until 1987, with the creation of the Isle of Dogs Neighbourhood by Tower Hamlets London Borough Council. Whitechapel is a district in Central and East London and the future administrative centre of the London Borough of Tower Hamlets, and is a part of the East End, and is 3.4 miles (5.5 km) east of Charing Cross. Because the area is close to the London Docklands and east of the City of London, it has been a popular place for immigrants and the working class. The area was the centre of the London Jewish community in the 19th and early 20th century, and the location of the infamous Whitechapel Murders of Jack the Ripper in the late 1880s. In the latter half of the 20th century, Whitechapel became a significant settlement for the British Bangladeshi community and today Brick Lane is an ethnic enclave known as Banglatown, as well as to the Royal London Hospital, Whitechapel Gallery, East London Mosque and the Royal Mint Court. Spitalfields is a locale and former parish in Greater London, South East England. It is within Central London and located in the East End and part of the London Borough of Tower Hamlets. The Liberty of Norton Folgate and the neighbouring Liberty of the Old Artillery Ground were merged into Spitalfields in 1921. Mile End is a locale of East London, England, 3.6 miles (5.8 km) east-northeast of Charing Cross. On the London to Colchester road, it was one of the earliest suburbs of the City of London and became part of the metropolitan area of London in 1855. In 2011, Mile End had a population of 28,544. The East End of London in popular culture covers aspects of popular culture within the area of the East End of London. The area is roughly that covered by the modern London Borough of Tower Hamlets, and parts of the south of the London Borough of Hackney. Columbia Road Flower Market is a street market in Bethnal Green in London, England. Columbia Road is a road of Victorian shops off Hackney Road in the London Borough of Tower Hamlets. The market is open on Sundays only.